Hello Friends. How's it going with you all? We're doing good at My Cozy Corner. I'm busy trying to put away some of my new Christmas stuff I found on the after Christmas sale shelves and really trying to stay focused on new posts for 2011. My mind is racing with crafty ideas and garden time is going to be here before I know it. Speaking of gardening~I have a beautiful flower to show you today. I love it. On the wintry days when I have something in the garden to show off. This is my Lenten Rose. The Lavender Tea sets are perfect for an afternoon tea party. I gave a tea party and each lady had a different tea cup, saucer and dessert plate. I thought this set would look lovely with my Lenten Rose bouquet. Lenten Rose or 'Helleborus' is a wonderful perennial for all zones. Blooms from January - March in our area. This flower has a large flower and many stamens. A vintage tea napkin in yellow goes so well with the deep purple of the Lenten Rose. On New Year's Eve one of my daughter's co-workers gave her some scone mix and my daughter asked me to bake the scones for her and the granddaughters. I love baking so this morning I baked the scones and shared a few slices with Sweetheart then took the rest up the street to the girl's house this afternoon. We enjoyed current scones and coffee. I just added 1/2 cup water and 1 egg slightly beaten and baked at 400* for 20 minutes. YUM!!! For Christmas a friend gave Sweetheart and I a jar of Key Lime Curd. It's just delicious on these current scones. The vintage spoons are my children's baby spoons. They work very well for curd or jelly and when I touch them I remember my children with their little mouths learning how to eat a little bit of cereal from a very small spoon. 'Willow Tree' Angel of Patience by DEMDACO 2011. Thank you for visiting My Cozy Corner. To all my blogging friends. Antique teacups and vintage friends. Who can live without them? Thanks again for visiting and please come back real soon. 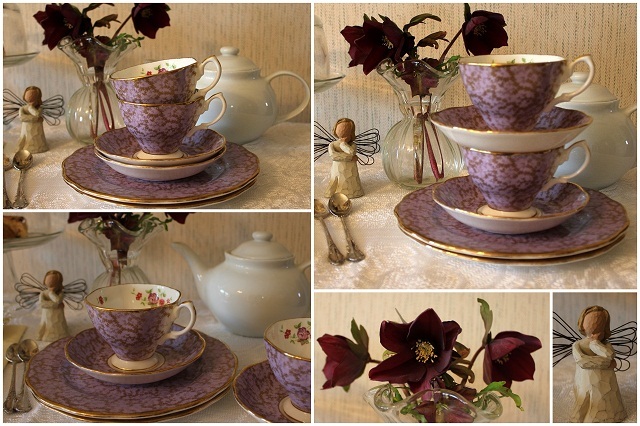 Your Royal Albert Lavender teacups are lovely.... perfect with your Lenten Rose. Happy Tea Day! Oh my, your Lavender teacups are simply gorgeous! What a beautiful colour and pattern and they look divine with your roses! The napkin is so very pretty too and your scones look wonderful. I love scones with curd of any kind and yours looks delish in the pretty glass dish. A simply lovely post and I thank you for sharing it with us today. These setting is so poetic! congratulations to such a beautiful Lenten Rose. Mine is still sleeping. 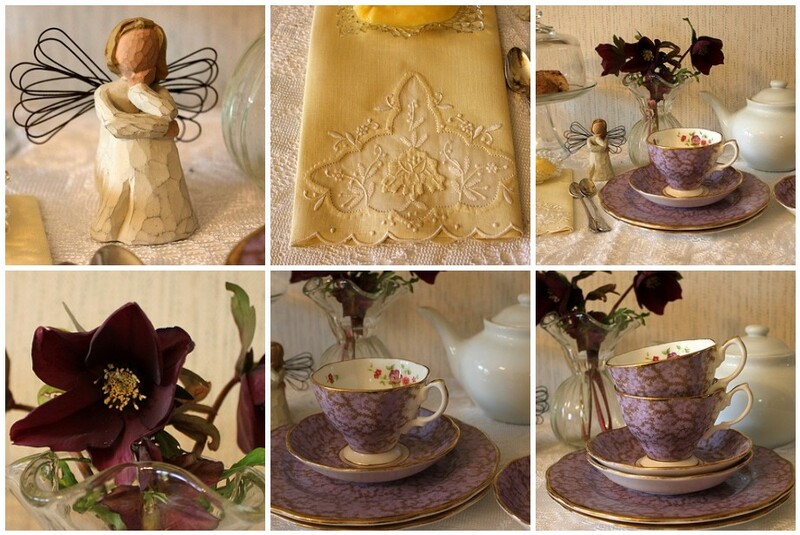 The Lavender tea cups are perfect to that deep red. And the napkin is stunning. What a beautiful embroidery. Thank you for that delightful tea time with scones and many eye candies. Your Lenten Rose is gorgeous, Betty! I love those lavender teacups. They are exquisite! I loved that Lavender Collectible Tea Series from Royal Albert and was so sad they discontinued it. Just Lovely!